Greenhouse whitefly (Trialeurodes vaporariorum) is the predominant species of whiteflies on strawberries in the Central Coast. What used to be a pest causing yield loss through direct damage has now emerged as a vector of a devastating viral disease called pallidosis-related decline of strawberries. In addition to strawberries, greenhouse whiteflies have a wide host range that includes important commodities such as avocados, caneberries, grapes, lettuces, peppers, tomatoes, and ornamentals grown in the Central Coast. All these crops serve as a source of infestation to each other and increased the threat of whiteflies not only to agricultural fields, but also to nurseries, and home gardens. Agricultural Commissioners' offices in both Santa Barbara and San Luis Obispo Counties and UCCE office received calls this year from strawberry growers, nursery producers, and the ornamental industry to address the whitefly issue. In response to this issue, I have increased the outreach efforts about whiteflies, their feeding damage, and disease vectoring potential through extension meetings and publications since January, 2013. Some fields in the Santa Maria and other areas which suffered from heavy whitefly infestations early in the production season later developed symptoms of pallidosis-related decline. Diagnostic tests conducted by CDFA and USDA laboratories in Salinas and Corvallis (Oregon) identified multiple viruses that cause the decline. Extent of infection varied from mild disease symptoms in some fields to total dieback. Corresponding yield loss also varied registering up to 65% reduction in some fields. Based the feedback received from various sources pallidosis-like symptoms are seen in strawberry cultivars from both public and private breeding programs. A good understanding of the pest and the disease it vectors is essential for effective management. Whiteflies get their name from white wings. Greenhouse whitefly is a small (1 mm long) insect with delicate, white, powdery wax covered wings. They deposit pale yellowish green eggs on the lower side of the leaf. Eggs are elongated and attached to the leaf with a short pedicel. Eggs turn dark as they mature. Greenhouse whiteflies have four nymphal instars which are oval, flat, and often semitransparent. Careful observation through a hand lens is necessary to detect their presence. First instar nymphs that emerge from the eggs are called crawlers which move around in search of an ideal feeding site on the leaf. Later instars are immobile. Fourth instar nymphs have red eyes and long, waxy filaments and are referred to as pupae. This is a viral disease caused by a complex of viruses transmitted by whiteflies, aphids, thrips, pollen, nematodes, seed, fungus, and unknown sources (Martin and Tzanetakis, 2006). Disease occurs only when one of the whitefly transmitted viruses along with one of the other viruses is present in the plant. Actual mechanism of infection and the synergistic interaction between the virus partners is not clearly known, but symptoms vary depending on the type of virus present. Whitefly-transmitted viruses include Beet pseudo-yellows and Strawberry pallidosis associated viruses (Genus Crinivirus). Non-whitefly transmitted viruses include Apple mosaic, Fragaria chiloensis latent, andStrawberry necrotic shock viruses (Genus Ilavirus) – transmitted by pollen and seed, Arabis mosaic, Raspberry ringspot, Tomato black ring, and Tomato ringspot (Genus Neopvirus), and Strawberry latent ringspot (Genus Sadwavirus)viruses – transmitted by nematodes and seed, and Strawberry chlorotic fleck (Genus Closterovirus), Strawberry crinkle (Genus Cytorhabdovirus), Strawberry latent C (Genus Nucleorhabdovirus), Strawberry mild yellow edge (Genus Potexvirus), and Strawberry vein banding (Genus Caulimovirus) viruses – transmitted by aphids. Pallidosis disease is indigenous to North America which was first described by Frazier and Stubbs in 1969 and first reported in California in 1975 (Mullin et al, 1975). Pallidosis virus could be latent in production fields and generally does not produce severe symptoms without the synergistic interaction with other viruses. Symptoms include stunted plant growth, purple or red coloration especially of older leaves, and brittle roots. When infection progresses, leaves dry out and plants eventually die. Newly emerged leaves may not show infection symptoms due to the seasonal fluctuations of virus titers, but virus is systemic and remains in the infected plants. When pollen-borne virus is involved, plants may recover from the symptoms of infection. 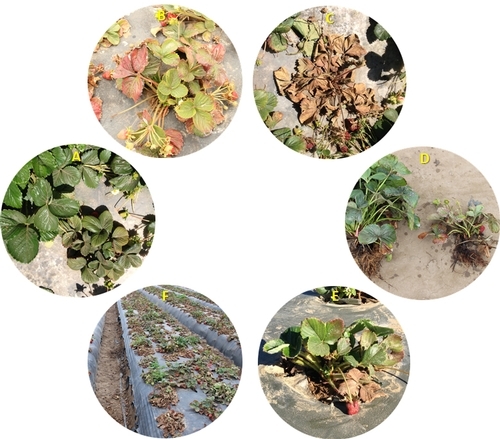 Since several recent strawberry cultivars have general tolerance to viruses, symptoms may not be visible when single virus or some combinations of viruses are present. The extent of disease symptoms from pallidosis-related decline also varies depending on strawberry cultivars and the combination of partner viruses. ELISA or PCR techniques are generally necessary to detect the causal organisms in infected plants. Nematodes are controlled by fumigation and are not a pest in strawberries, in general. Various species of aphids occur at low numbers in California strawberry fields and usually do not require targeted treatments. 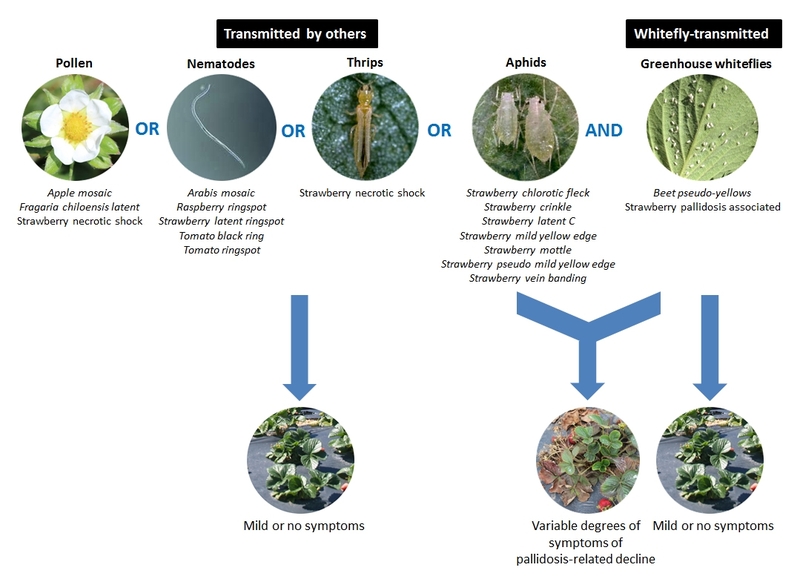 However, increased whitefly infestations on newly planted strawberries coupled with aphids and pollen transmitted by multiple partner viruses probably contributed to this new problem. For a problem such as pallidosis-related decline vectored by a widespread pest like whiteflies, a multi-disciplinary approach with the partnership of multiple agencies is required for an area wide management. With overlapping seasons of fall and summer plantings extended by second year production and the presence of other hosts, whiteflies may continue to be present throughout the year and pose an increased risk. Efforts are necessary to break the pest cycle and minimize the disease risk. Pallidosis disease – There are no chemicals to treat the disease. Use disease-free transplants to prevent the introduction of one or more partner viruses into the production fields. Additional virus screening may be necessary to test for more viruses that could contribute to this disease. Manage whitefly and aphid vectors to reduce the spread of the disease. Avoid planting close to infected fields. Monitor for whiteflies and manage them on nearby hosts or second year berry fields especially those upwind before they move to newly planted or other fields. Second year berry fields can be a good source of infestation for the new fields. Pruning them close and discarding the debris is important in reducing the pest pressure. Water roadways to prevent dusty conditions to promote natural enemies. Chemical control: For whiteflies, use lower volume of spray fluid than usual, pass the sprayer more slowly, and ensure thorough coverage of the lower side of the foliage. Rotate chemicals in different modes of action groups. Sodium channel modulators (3): Fenpropathrin (Danitol) and pyrethroids. Acetylcholinesterase (AChE) inhibitors–Organophosphates (1B): Diazinon and malathion. Botanical pesticides:Azadirachtin is a neem-based insect growth regulator and is effective against immature stages. Natural pyrethrins affect the nervous system as sodium channel modulators. 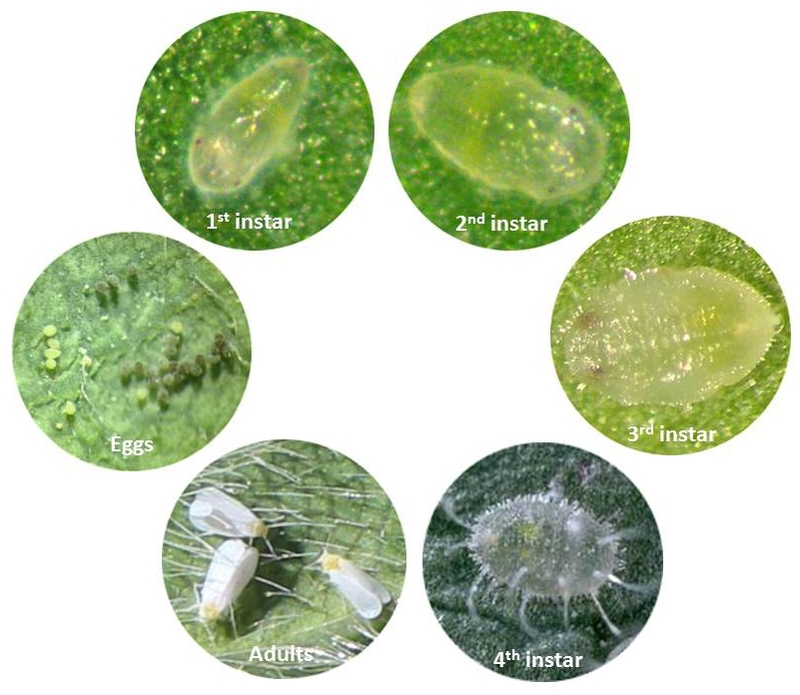 Microbial pesticides:Insect pathogenic fungi such as Beauveria bassiana, Metarhizium brunneum, and Isaria fumosorosea can be used against whiteflies and aphids. Dara, S. 2013. 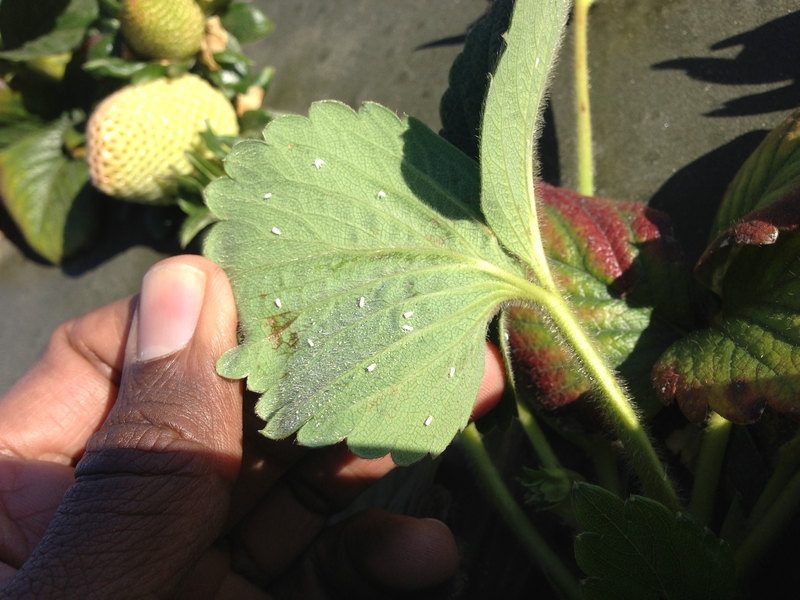 Whiteflies becoming a concern for the strawberry growers (http://ucanr.edu/blogs/blogcore/postdetail.cfm?postnum=9167). Frazier, N.W. and L.L. Stubbs. 1969. Pallidosis-A new virus disease of strawberry. Plant Dis. Rep. 53:524-526. Martin, R. R. and I. E. Tzanetakis. 2006. Characterization and recent advances in detection of strawberry viruses. Plant Dis. 90: 384-396. Mullin, R. H., N. W. Frazier, and D. E. Schlegel. 1975. Meristem culture of Fragaria chiloensis infected with pallidosis. Plant Dis. Rep. 59: 268.